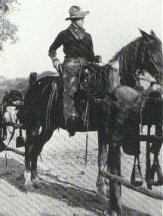 ..ERB / Zane Grey Connection..
Died 1950 in Tarzana, CA . Incredibly, these two immensely popular authors, who spent most of their writing careers in Southern California, never met. Their lives and works, however, are so closely juxtaposed that it is interesting to make a comparative study. Zane Grey was a best-selling author of over 85 books, which have sold well over 100 million copies worldwide.  Most of these books drew upon the American Old West or the great outdoors for inspiration and are acknowledged as some of the best Western adventure novels ever written. 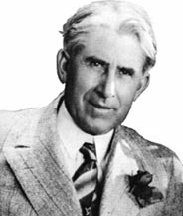 Although Grey died in 1939, his legacy remains with us today -- he has inspired countless imitators and his work has been adapted to all modern media -- movies (a record 111 films), radio & television (Zane Grey Western Theatre), magazines (Zane Grey Magazine), comics (King of the Royal Mounted, etc. ), paperbacks, talking books, Internet (websites and electronic texts), etc. 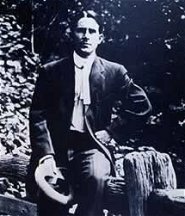 Zane Grey almost single-handedly created the "Myth of the West." He celebrated the natural beauty of the West and glorified the character and frontier values of its people. 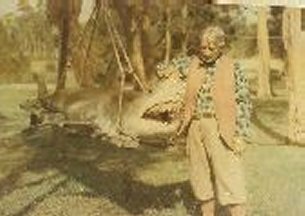 His respectful treatment of Indians was ahead of its time and his word paintings of some of the world's most spectacular country may never be equaled. 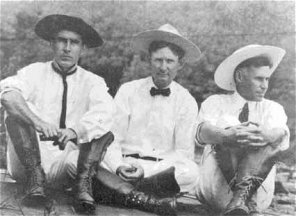 Edgar Rice Burroughs and Zane Grey were contemporaries. They wrote a corresponding number of novels with a pretty much equal number of best sellers that sold hundreds of millions worldwide. 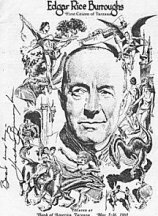 Most of Burroughs' books dealt with highly imaginative themes -- which have earned him the title of Grandfather of American Science Fiction, Master of Fantasy Adventure, and Creator of Tarzan. As with Grey, Burroughs' legacy lives on today -- he has inspired countless imitators in the genres he pioneered and more movies have been made featuring his Tarzan than almost any character in filmdom history. He surpassed every other author in marketing his creations in every type of 20th century media. Even though they wrote in somewhat different styles, describing different locales, many of their readers will find it interesting to learn just how closely paralleled were their life and works. They both wrote in very romantic prose and shared a love for the beauty of unspoiled natural wildernesses. Their conservationist views were far ahead their time and they immortalized rugged outdoor landscapes and the noble heroes and heroines who were thrown into exciting adventures across these lands. Both men disliked their first names. Both men's middle names were ancestral sir names. Both men preferred the British spelling of "Grey." 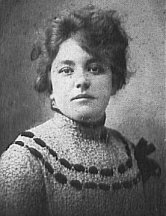 The name Pearl Zane Gray was chosen as a play on the popular colour of the day, pearl gray. It was Queen Victoria's official colour of mourning for her deceased consort, Albert. When ZG started writing he dropped the somewhat embarrassing "Pearl" and took the family name Zane. He also changed Gray to the British spelling of Grey. 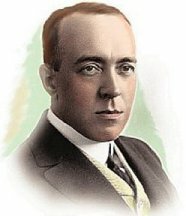 Edgar Rice Burroughs disliked the name Edgar -- he was always "Eddie" and later "Ed" to his family and friends. He often stated that he would have preferred to have been named John, and this is the name he used for the two most popular heroes in his books: John Carter of Mars and John (Tarzan) Clayton, Lord Greystoke. He also was a longtime admirer of things British. Both men had ancestors noted for their pioneer spirit. Colonel Ebenezer Zane led settlers west and then fought in the Revolutionary wars. The colonel's sister, Betty Zane, went through British and Indian lines under heavy fire carrying powder to the besieged Fort Henry. ERB was also from good pioneer stock going all the way back to family friend George Washington. 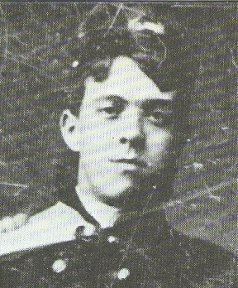 His father, Major George Tyler Burroughs, was decorated by Abraham Lincoln for his actions with the Union army in the US Civil war. His mother, Mary Evaline, actually donned men's clothing to join her husband on the front lines of battle, as related in her book: Memoirs of a War Bride. Both young men were avid sportsmen in their college / military academy days but were indifferent students throughout most of their academic years. ZG was a star left fielder and hitter for the University of Pennsylvannia baseball team. 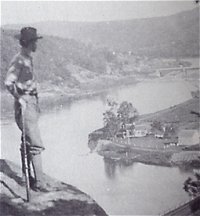 He developed his love for the outdoors very early in life during his outings along the Delaware River. ERB was quarterback and team captain for the Michigan Military Academy football team. 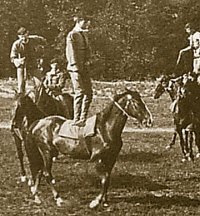 He was also a champion show rider mastering many styles of riding. 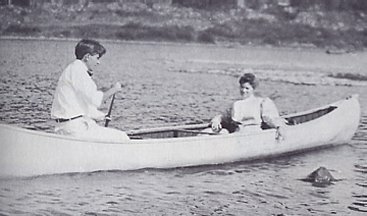 A few years earlier, ERB's brothers had been on Yale championship rowing teams. Both students graduated from their schools in 1896. 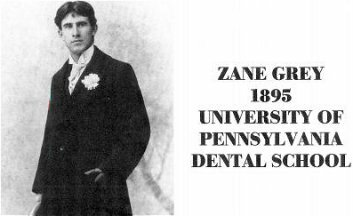 ZG went into dentistry, graduating from the University of Pennsylvania Dental School. He opened an office in the Graystone apartments in Manhattan. 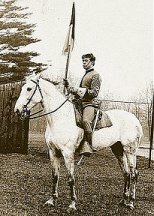 ERB returned to a position of assistant commandant and instructor of geology, gatling gun use, riding and drill at the Michigan Military Academy. 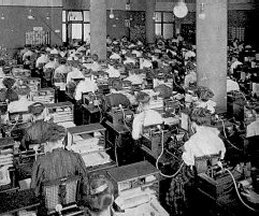 A few years later he did well in the business world as a the head of the Secretarial Department of the Sears and Roebuck, Co. in Chicago. Both were influenced by colourful outdoorsmen in their early years. ZG attended a New York film presentation by Buffalo Jones. He immediately offered his services for expeditions to wild west Arizona. 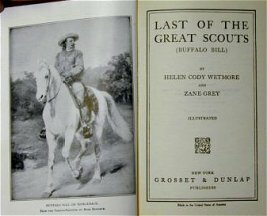 One of the first pieces of writing done by ZG was the foreword for the 1899 book about Buffalo Bill, Last of the Great Scouts by Helen Cody Wetmore. ERB was influenced by Captain Charles King, a veteran of all the US military conflicts fought in his lifetime. He also was ERB's commandant at MMA for a time and was a best-selling author of military adventures. ERB was almost certainly influenced by Buffalo Bill Cody at the Chicago Columbian Exposition of 1893. 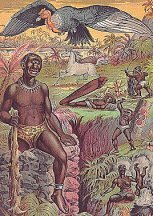 Accounts of Africa by explorers such as Henry M. Stanley were also a major influence in his formative years. 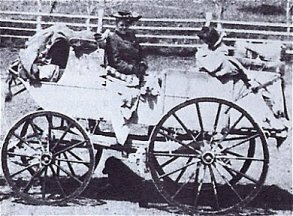 Both young men were dissatisfied with their first occupations -- they were dreamers and had a wanderlust, which led them through many personal adventures in the "wild west." 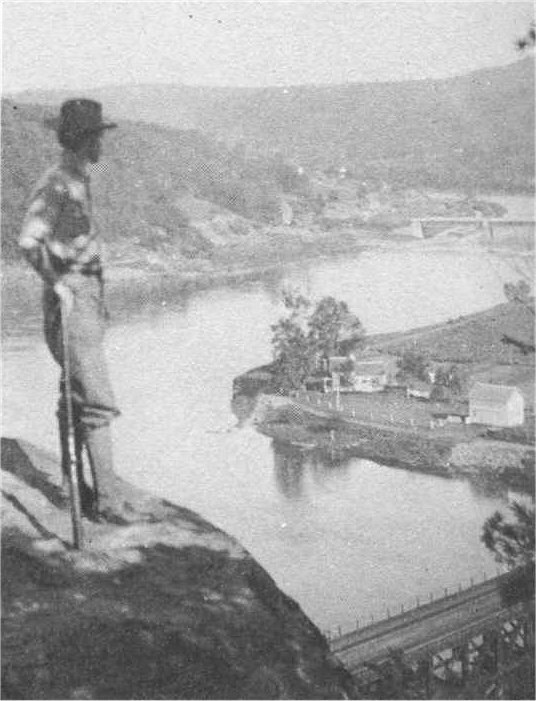 ZG spent much of his time with his brothers fishing and enjoying the outdoors along the Delaware River. And then gave up his dental practice to go on western adventures. 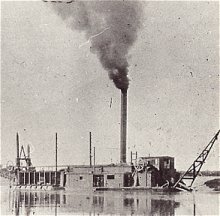 ERB had worked on his brothers' cattle ranch and gold dredging operations along the Snake River in Idaho. Tiring of his teaching job at MMA, he joined the US Cavalry and went west. Age 35 was the turning point in their careers. 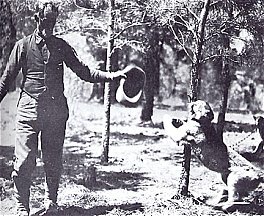 It was at this age that ZG accepted Buffalo Jones' offer to join him, at his own expense, in an expedition to Arizona. It was a bold gamble that took all of his and wife Dolly's savings. Until this time his first attempts at writing were as a city dentist who loved to rough it in the Delaware River area. His Arizona adventure was the first of many more he would take through his life. 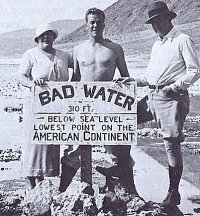 These expeditions instilled a true passion for the West and provided him with exciting and accurate background material for his a continual stream of adventure novels and real-life articles. By age 35, ERB had changed careers many times, and most of his career decisions had not been wise ones. The Ed Burroughs family was subsisting at a poverty level when in desperation he submitted a "far-fetched" Mars adventure to the pulp magazine All-Story.The story was accepted, as were an almost 40-year string of more to follow. 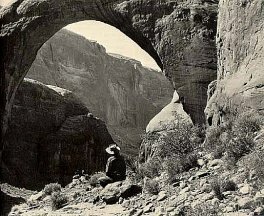 Both spent time in Arizona during their formative years and were drawn back to the rugged grandeur of this state many times in their later years. ZG met Buffalo Jones during one of the adventurer's lectures in New York City. 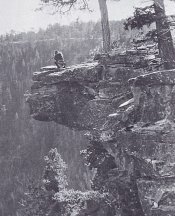 Grey realized that he could never be content in his career as a New York dentist and immediately offered his services for Jones' upcoming expedition to Arizona. This proved to be the turning point in his life as he spent the rest of his life making such expeditions to the wild and sharing the experiences in his real-life articles and novel fiction. 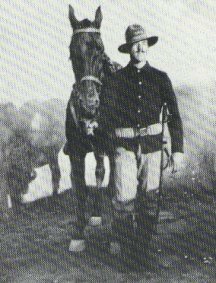 ERB was posted at Fort Grant in Arizona with the US 7th Cavalry. 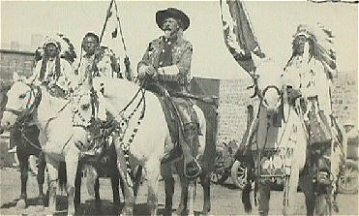 The experience of chasing Apache renegades and meeting real westerners gave the young soldier military experience and appreation of where they chased Apache renegades. 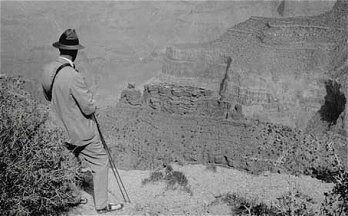 Starting in 1919, after they had settled in Southern California, both men took their families on trips to Grand Canyon and Arizona. They also both made trips to Death Valley. Both wives played an invaluable supportive role -- accepting their husbands' wanderlust and thirst for adventure. And later when they began their writing careers they were excellent sounding boards and proof readers for the work. 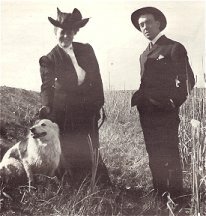 ZG met his future bride, Lina Elise "Dolly" Roth in 1900. Both men developed an early interest in photography and kept ongoing photo records of family and of their many interests and travels. ERB even ran a stationery/camera shop in Idaho in his younger days. 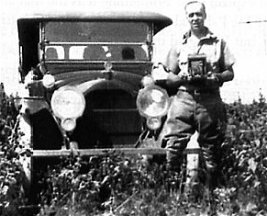 His love interest in photography was passed on two his two sons who became expert photographers -- Hulbert served as a combat photographer in WWII and Jack used photography extensively in his art projects.